When you leave a comment on THIS post by 6 p.m. CT Sunday, June 23, 2013 you'll be entered in the DRAWING for a copy of the book mentioned below. If you mention in your comment that you’re a follower (see in the left column “Join This Site” and “Follow by Email”), I’ll add your name a second time in the drawing. You must be eighteen, have a U.S. mailing address, void where prohibited. You can read details about my book giveaways at Disclaimers. Before I wrote the Caney Creek Series novels, I had some short stories traditionally published. But my writing for publication began with nonfiction. 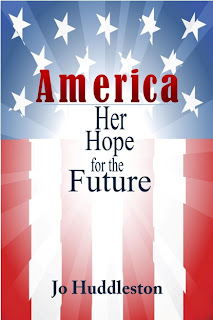 I want to introduce you to one of my nonfiction books, America: Her Hope for the Future. Nothing is ever so perfect that a little improvement wouldn't be welcomed. This principle holds true for America. Our country probably never has been perfect. Far from it or our history wouldn't be speckled with war and depression and poverty and discrimination. But the pock marks of adversity can serve as stepping stones toward a better today and tomorrow. When in the spasms of hardship, we long for something better. Something that could work. This "something" contained elements available today. Perhaps these elements could be blended into a palatable recipe to ease fears and tensions. "Jo Huddleston takes a refreshing and healthy look at the virtues and lessons we learned from our past. The chapters on courage and patriotism show us that we can better understand the problems of the present, and be prepared for the future if we take the time to apply the wisdom learned from our past." "A challenging, inspiring vision for America. Jo Huddleston's easy style of writing and her art of persuasion make readers of this inspiring work reflect on their lives with rededication and appreciation for the past.This excellent work can become a cornerstone for our homes, our cities and our country. This book is the hard rock of ethical values. "Jo Huddleston brings us a very apropos and timely book on the State of the Nation . . . very moving, practical, and patriotic." Remember: leave a comment on THIS post by 6 p.m. CT Sunday, June 23, 2013 and you'll be entered in the drawing for a copy of America: Her Hope for the Future by Jo Huddleston. You must be eighteen, have a U.S. mailing address, void where prohibited. Please, please remember to leave your email address so that should you be the winner I can get in touch with you for your mailing address. I’ll announce the winner in Monday’s blog. NOTE: Read my Monday blog to visit with characters in Beyond the Past, book 2 in the Caney Creek Series. If you leave a comment there totally about the interview you'll receive an extra entry when you comment on the next Thursday's blog. I look forward to reading your books. Thanks for your love for our country. Majorie, thank you for your interest in my books and in my love for our country. Glad you came by and left your comment. Good luck in the book drawing. Sounds like a great book, Jo. I'd love the chance to win a copy. Thank you for the opportunity. Patti, thanks for stopping by and leaving your comment. I see your email address in your next comment box--glad you remembered. Good luck in the book drawing. Jo, your book sounds great. I love my country and I would not want to live anywhere else. Thank you for the opportunity to win your book. Also, I am a follower on your site and email. Katie, thanks for your kind words about my book, America. Glad you came by and left your comment. Good luck in the book drawing.